IDrive provides an easy, secure and reliable way to restore individual emails from a Personal Folder (.PST) file to the MS Exchange Server Store through the 'Exchange Brick-Level Mailbox Restore'. The application restores the contents of the selected Personal Folder (.PST) file to a corresponding Exchange Server Mailbox. 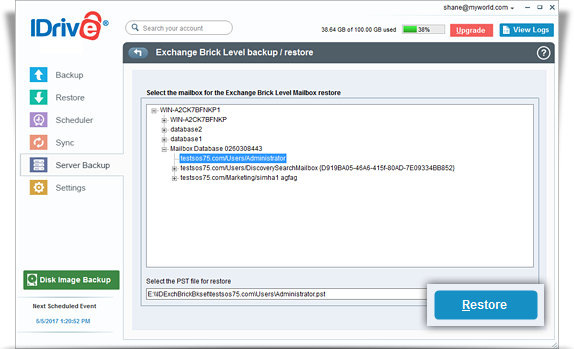 IDrive 'Exchange Brick-Level Mailbox Restore' is designed to restore individual emails from a Personal Folder(.PST) file to the selected Exchange Server Mailbox. This is not a method for the complete recovery of the Exchange Server databases. Use the 'Exchange Server restore' feature of the IDrive application to perform complete recovery. Note: Ensure that appropriate Mailbox Rights are granted to perform the 'Exchange Brick-Level Mailbox Restore' of the selected mailbox. Online restore of individual emails from your Personal Folder (.PST) file to MS Exchange Server Mailbox store without interrupting the running MS Exchange Server services. Session based logs of restore activities. Login to the IDrive application and click the ‘Restore’ tab. Locate and select the personal folder (*.PST) from the ‘IDExchBrick’ folder in your IDrive account. Click 'Restore Now', to restore the .PST file to the local computer. Once the .PST file has been successfully restored, click the ‘Server Backup’ tab. Click 'Restore,' under Exchange Brick Level section. Browse and choose the .PST file (restored earlier from your IDrive account). On selecting this option, the application copies the email to the Exchange store even when it is already present. Thus, a duplicate email is created in the Exchange store. On selecting this option, the application checks whether the copied email is present in the Exchange store. If it is, then the email is not copied on restore. Replace existing data in Exchange store: On selecting this option, the application checks whether the copied email is present in the Exchange store. If it is, then email is first deleted from the Exchange store and then copied.